ERNEST HEMINGWAY'S LAST UNPUBLISHED WORK! 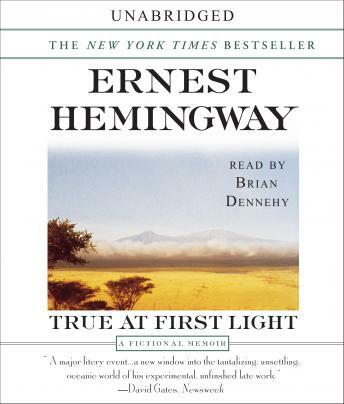 A blend of autobiography and fiction, True at First Light opens on the day Ernest Hemingway's close friend Pop, a celebrated hunter, leaves him in charge of the safari camp and news arrives of a potential attack from a hostile tribe. Drama continues to build as his wife, Mary, pursues the great, black-maned lion that has become her obsession. Equally adept at evoking the singular textures of the landscape, the thrill of the hunt and the complexities of married life, Hemingway waves a tale that is rich in laughter, beauty, and profound insight. True at First Light is the breathtaking final work from one of this nation's most beloved and important writers.